Automotive Turbochargers Market size is estimated to exceed USD 24.5 billion by 2024; according to a new research report by Global Market Insights, Inc.
Increasing demand for high performance and fuel-efficient vehicles coupled with strict emission regulations will primarily drive the automotive turbochargers market size. Vehicles equipped with these products can reduce the carbon emission by up to 20% and 15% for diesel and gasoline-powered engines respectively. Enabling vehicle manufacturers for compliance with the emission norms will provide strong industry growth prospects over the forecast period. 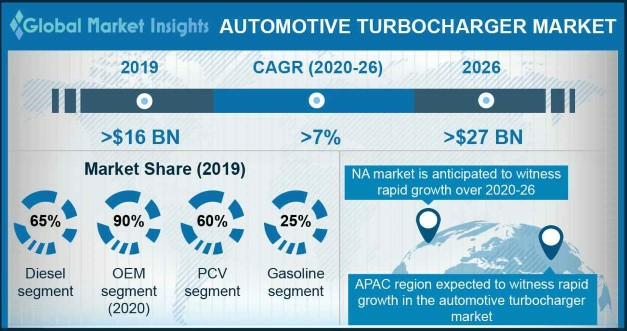 Gasoline segment will witness highest growth and is expected to account for over 32% automotive turbochargers market share by 2024. This is attributed to the high RPM generation and efficient fuel combustion in vehicles. Moreover, owing to high flammability of gasoline over diesel, system design contributes low space footprints. Thus, it contributes to the compact combustion chambers along with smaller engine components providing better fuel efficiency. Aftermarket distribution channel in automotive turbochargers market is expected to witness growth at around 11% over the forecast timeframe. Aftermarket channels primarily cater to the replacement of damaged or failed engine components and customized consumer requirements. Increasing average fleet age across major economies will fuel the replacement and maintenance requirements. Engine downsizing is the major trend that have gained significant emphasis among the automotive industry participants. A V8 engine can easily be replaced with V6 engine and a V6 engine can be replaced by V4 equipped with a turbocharger. Engine replacements do not impact on fuel economy, efficiency, and power of the vehicle. Ability of the downsized engine to provide 20% increase in vehicle efficiency will fuel the automotive turbochargers market growth. Production and sales of passenger vehicles in Europe and emerging economies in Asia Pacific are increasing owing to domestic and international demands. Some of the major automobile manufacturers in Europe include Volkswagen, Ford, Honda, Opel/Vauxhall, Mazda Motor, Chevrolet, Audi, BMW, Mercedes-Benz, Peugeot, and Renault, have witnessed initiatives for expanding their vehicle production. Considerable increase in vehicle production and sales in conjunction with the requirement for compliance with future government norms will propel the automotive turbochargers market size through the forecast period. Engine horsepower falls 3% with every 1,000 feet above sea level. For instance, in India, road conditions range from sea level to 6,000m resulting in the 18% reduction of power produced by the engine. However, the performance of automotive turbocharger improves at high altitudes owing to the increase in pressure difference in turbines and outer atmospheric pressures, in turn positively influencing the industry growth. Limitations associated with existing turbocharge systems that include turbo lag, limited boost threshold, reduced traction are among the major system drawbacks, negatively affecting the consumer inclination. Moreover, proliferation of electric vehicles featuring electric motors and battery powered systems with low maintenance cost and longer product life are expected to hamper the automotive turbochargers market size through the forecast period. PCV’s hold dominance and is expected to witness highest gains over the forecast timeframe. Increasing production and sales of premium passenger vehicles owing to a surging demand for luxury vehicles in China, the U.S., Germany, UK, and Brazil are stimulating automotive turbochargers market share. VGT/VNT technology accounted for the largest automotive turbochargers market share in 2017. It is extensively used in commercial & off-highway vehicles and passenger vehicles for boosting the internal engine combustion performance. Increasing adoption of customized vehicles for recreational activities, motorsport events and military operations will positively influence the requirement of technologically-advanced solutions. Europe held the largest automotive turbochargers market share and is projected to continue its dominance over the study timeframe. High penetration of passenger cars in conjunction with the stringent regulations to keep the automotive emissions in check are expected to be among the prominent factors contribute to the regional growth. Moreover, significant presence of major automotive manufacturers such as Mercedes Benz, BMW, Audi, Volvo, and Volkswagen will drive the industry growth through the forecast period. Honeywell International, Inc., IHI Corporation, Cummins, Borg Warner BMTS, and Mitsubishi Heavy Industries are among the major automotive turbochargers market participants. Other industry participants include Precision Turbo & Engine, Turbonetics, Inc., Rotomaster, The Turbo Engineers GmbH, and Turbo Energy Private Limited. Acquisition of small and medium industry participants to diminish competition and expand their industry presence are the key strategies to gain industry foothold. For instance, in February 2016, Linamar Corporation acquired Montupet S.A., which is a cast aluminum parts manufacturer for vehicle components.